Who is Jody Wilson-Raybould (and why should you care)? I know it can be tough to stay on top of politics and most of it can seem really dry, but the politicians of today are building the world we will have to live in, so it’s worth knowing what we’re going to inherit and what people are doing to help us or help themselves. Even if you’ve only been reading the headlines for Canadian news, the name Jody Wilson-Raybould is probably starting to look familiar. Recently, she’s been making waves for resigning from the Prime Minister’s cabinet and the ensuing political drama, but more on that later. Who is Jody Wilson-Raybould, and why should you care? Becoming the MP for Vancouver-Granville in 2015 was not the beginning of Wilson-Raybould’s political work. She went to law school and was a Crown Prosecutor in Vancouver’s roughest neighbourhood— the Downtown Eastside. For twelve years, from 2003 to 2015, she worked in Indigenous governance and activism, starting with joining the B. C. Treaty Commission, which works on modern treaties between First Nations groups and the Crown [note: the Crown technically refers to the Queen of England, because she is Canada’s head of state. In most matters, though, somebody who is working with or negotiating with the Crown is working with the Government of Canada as a whole]. 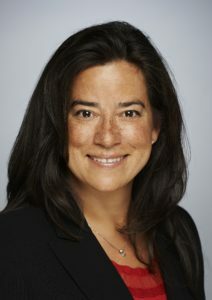 Wilson-Raybould also served as a councillor for the We Wai Kai Nation (of which she is a member) and as the Regional Chief for the B. C. Assembly of First Nations, working on issues surrounding reconciliation, especially First Nations land rights and right to self-governance. She was an active part of Idle No More and spoke directly to then-Prime Minister Stephen Harper on a plan she had helped devise for First Nations self-governance. Wilson-Raybould places a lot of importance on her First Nations heritage, and she also goes by her Kwak’wala name Puglaas, which means ‘A woman born of noble people’. In 2015, she ran and won as a Liberal in the riding of Vancouver-Granville. She also became the first Indigenous person to be appointed the Minister of Justice and Attorney General. She was also only the third woman to take the position (out of a total of 52). Some of the things she worked on while she was in this position included Bill C-16, which protects people from discrimination on the basis of gender identity, marijuana legalization, and amending sexual assault laws to make it clear that an unconscious person cannot consent. She also continued to work and advocate for reconciliation. But now everyone’s turned their attention to her for another reason: the SNC-Lavalin affair. This is a bit complicated, but these are the basics. SNC-Lavalin is a Quebec-based engineering company that has been charged with bribing foreign government officials. A lot of the work the company does comes from government contracts, and if the company is prosecuted, it means that they can’t take any of those contracts for ten years. SNC-Lavalin lobbied the government to get them to write a law that would make it possible for them to settle the charges out of court— probably by paying a fine— and the government passed that law in September of 2018. This is called a Deferred Prosecution Agreement, and it exists to protect the people at the bottom: the employees and others who would be affected by the prosecution but did not participate in the crime. But there’s a catch: a company can’t just get a DPA. There’s a council, independent from the government, that has to agree to it. And they didn’t. Only one person can change that decision, and it’s the Attorney General, who was, of course, Jody Wilson-Raybould. Wilson-Raybould decided not to make the council change their minds, and that’s where the scandal around her actually starts. After she made that decision, she reports, people from the Prime Minister’s office, and even Prime Minister Trudeau himself, put pressure on her to change her mind and force a DPA for SNC-Lavalin. This is something they aren’t allowed to do— the Attorney General’s decision is their own, and nobody can make them choose one thing or the other. The other problem is with the arguments the Prime Minister’s Office used: they were about the negative effects on the economy that come from losing the business of a big company like SNC-Lavalin. Except that the law specifically states that the decision about a DPA cannot include a consideration of economic concerns. They were asking her to consider the one thing she wasn’t allowed to take into account. Wilson-Raybould stuck to her decision. In January, Trudeau took her away from the position of Attorney General and made her Minister for Veterans’ Affairs instead. He didn’t say it was because she wouldn’t change her mind, but the person he replaced her with seems more willing to go along with a settlement with SNC-Lavalin. In February, Wilson-Raybould resigned and explained to the public why. So that’s why she’s so important. The justice system as a whole can’t be bossed around by the Prime Minister or his office, and Wilson-Raybould stood against them to make sure of it, even though she lost a very prestigious and influential position because of it. Now, she’s continuing to hold the government accountable, even as they try to downplay it. And remember that this issue is only one of the many things that Wilson-Raybould continues to stand for as she continues to represent her constituents in Parliament and work for Canadians. For a longer explanation of the SNC-Lavalin affair, try here or here.